the banking bailout. This was also an election year. Now I’m no financial expert with a game plan to move our economy toward prosperity. But I do have a positive message of personal growth to help manage the stress that comes with economic concerns. I believe bounce-back ability is the single most important factor for success in managing expectations and turning adversity into success in the business world. Bounce-back ability is a combination of resilience, focus, and extreme confidence that nothing will deter you from reaching your objectives. In June of 1984, I entered the National Basketball Association as a naive rookie with high expectations and the passion to compete against my boyhood idols Kareem Abdul Jabbar, Julius Erving, and Magic Johnson. Throughout my 10-year NBA basketball journey, I was a member of eight teams, was traded seven times, played for 14 coaches, and had nearly 150 different teammates. There were trade rumors and negative articles, while the internal pressure to perform caused a tremendous deal of stress. Thanks in no small part to arduous cross-country travel and constant bouts of sleep deprivation, I faced constant fatigue during the grueling eight-month-long season. My body sustained a physical beating from daily practices and games. I suffered a broken nose, surgery for a detached and torn retina, three concussions, cracked ribs, a broken thumb, a torn rotator cuff, a dislocated shoulder, a fractured foot, a broken toe, and eight knee surgeries. As an NBA player, I became an expert in adversity management. Training camp in the NBA is a month of long practices and a massive workload that is the foundation of a successful NBA season. Practices are three hours long, and they’re held twice a day. Weightlifting sessions and film study fill the remainder of your free time. Training camp is a time to focus on the fundamentals that lead to tremendous individual and team accomplishment. One of the most critical lessons I learned early in my playing career focuses on the realization that you must produce or you’ll quickly be replaced. The NBA is a cold-hearted business based on productivity. You’re encouraged to push yourself hard, improve your skills, and add value — all within a team concept. The same principle applies in this challenging economy. If you’re a key component of the company’s success, you’ll most likely continue in a productive capacity. Winston Churchill said, “Continuous effort — not strength or intelligence — is the key to unlocking our potential.” The key to success today is a strong work ethic and focused effort that relies heavily on the old-school approach of grabbing your lunch bucket in the morning, rolling up your sleeves, putting on your hard hat, and going to work. The length of an NBA season creates a tremendous challenge to most NBA players. Training camp begins in October, and the NBA finals run through the end of June. The marathon nature of the NBA season takes a great deal of patience and the ability to focus on the future. The same forward-thinking mindset is needed to manage the difficulties of our nation’s current financial situation. We can’t control all the outside influences and problems with the economy, but we can dictate the way we respond to the negative news and distractions. related to the economy. It’s important to be aware of the possible ramifications of the economic crisis, but it’s unproductive and potentially harmful to our health to become consumed with issues we can’t control. When challenges arise, many people immediately focus on the problem and not on the opportunities that exist. I believe a key ingredient for high achievers is the ability to find new and innovative ways to elevate their game and improve during the toughest times. If we focus on the insurmountable odds, we fail to see all of the positive directions that we can potentially explore. Throughout our economic history, the most successful investment philosophies have focused on patience and long-term growth strategies as the safest way to build a portfolio. Business plans target small, incremental steps of growth and improvement. Our ability to maintain tunnel vision on our future goals and to not be distracted by current roadblocks is a key component of bounce-back ability. During my NBA career, I quickly learned that losses, disappointment, and frustration are all part of the game. The routine was to analyze a win or loss and move on to the next game with an optimistic outlook. Even on my worst days, I could rationalize that I was incredibly blessed to be an NBA player, and it was imperative to focus on the positives. We are among the most fortunate civilizations that have ever walked the planet. The standard of living that we possess and the freedom to pursue individual goals is unprecedented throughout history. Life is good, regardless of the economy, and we should wake up each morning and be excited about the possibilities that exist. I believe strongly in the power of positive reinforcement and the value of affirmations. Our mind is a powerful resource, and if we focus on encouraging messages, good things will happen. A positive attitude is a choice we make. The significant challenge that we face on a daily basis is the internal battle of positive and negative input. The pressure and intensity of life can break us down, and it’s a constant struggle to ignore the negative messages being circulated. We watch the news and read the paper, and we begin to worry. There’s a home foreclosed in the neighborhood and the doubt begins to surface. A friend loses his job and we wonder if we’re next. About 72 percent of self-talk is negative, and that means we spend the entire day filling our brain with limiting thoughts. The power of bounce-back ability lies in the attitude of knowing that you may be down, but it won’t be for very long. It’s an understanding that adversity creates the opportunity for growth, both personally and professionally. Difficult times are a perfect chance for reassessing goals and evaluating future options. You’ll bounce back from defeat because you’ve done it so many times in the past. 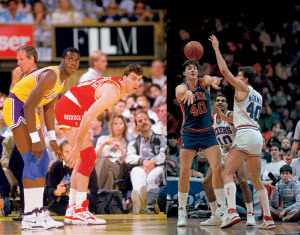 The average NBA career is approximately four seasons long. That’s it. It’s a very fragile existence that can end just as quickly as it begins. I was a starting center for the majority of my first five seasons in the league. But it wasn’t until a major knee injury sent my career on a downward trajectory that I started to appreciate how fortunate I was to be living my dream. Hard times like that can actually serve as a reminder of the things in life that are most important. The health and well-being of our family members needs to be emphasized over the falling value of our 401(k) plans. The materialism and greed pervasive during prosperity is usually replaced by more quality time with family and friends. The foundation of my bounce-back ability philosophy is centered on a belief that we’ll constantly be challenged with obstacles and adversity throughout our lives and careers. The champions in sports and business are the high achievers who understand that challenge is what makes life interesting. We’ll experience many financial highs and lows, and we may have several jobs and professions along the way. If we focus on the core principles of bounce-back ability, we can overcome any challenges that we might face. The lesson I learned from my basketball career is that you can’t change the environment in which you live, but you can control the enjoyment of your journey. Tim McCormick is a business consultant, motivational speaker, and ESPN college-basketball analyst. He is principal of Never Be Average.